This is only a one day performance! Through bodily performative acts, artists Julie & Ronit will explore and immerse you into their memories by interacting with different objects loaded with symbolic and personal meanings, which reflect their Russian heritage. 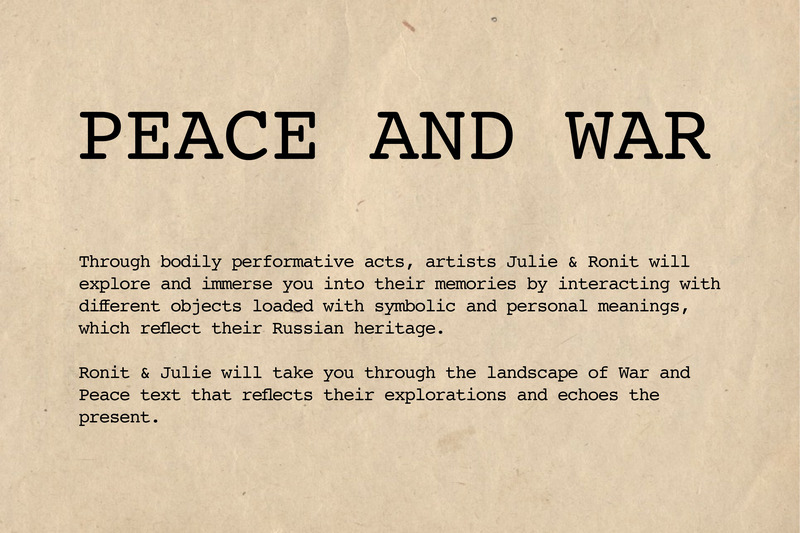 Ronit & Julie will take you through the landscape of War and Peace text that reflects their explorations and echoes the present. Screening of two films directed and created by a Russian filmmaker Joseph Goldman “A Fine New Day” and “Lech-Lecha”. The films that were created before the current events but timely reflecting the present. Mr. Goldman is a member of the Moscow playwrights’ professional committee. During 35 years of professional activities as a script writer, Mr. Goldman participated in the creation of hundreds of film projects, including feature films, documentaries, popular science and publicity films. He has also written scripts for television broadcasts, plays, and television films. Ronit Levin Delgado (born Tel-Aviv, Israel) a Fulbright scholar, lives and works in NYC. She has had numerous exhibitions in NYC as well as internationally.